Madison Bumgarner made his mark immediately as a rookie. Why is the World Series such a great event? One reason is that, every year, without fail, someone seizes control of his own destiny and makes the most of the chance. Last night, that was Madison Bumgarner. It’s two days later. It’s been two days since I started hugging and high-fiving strangers in the Dubliner Pub on Mass. Ave. and singing “Sweet Caroline,” for god’s sake. “Sweet Caroline.” I can’t stand that song. But it was in that bar where we booed whenever Cardinals manager Mike Matheney called for David Ortiz to be intentionally walked, the last act of an exasperated team in dealing with the hottest hitter on the planet. And it was in there we cheered and screamed and ordered more beers when Shane Victorino cleared the bases with a triple. And it was in there were everyone grew simultaneously silent, then roared when Koji Uehara’s 2-2 pitch missed Matt Carpenter’s bat for strike three, the third out of the ninth inning. And just like that, the 2013 Boston Red Sox had won the World Series. It wasn’t until that 2-2 pitch that the enormity of the situation began to sink in. Yes, I was very aware that I was watching what could potentially be the clinching game of a championship season — I’d spent the two days prior sitting at my desk and sweating over the ramifications of it all. And I stood nervously with my friends while we watched John Lackey work into the seventh inning, cinching his spot in Boston lore forever with his bounce-back season and his stellar pitching in October. But it wasn’t until Uehara was a strike away on Carpenter that I realized what I was watching: there were only two teams left playing Major League Baseball, that 28 others had already ended their season in disappointment, and the 29th was on the ropes and clinging to a fraying thread of hope, and that when that third strike found its way into David Ross’ glove, they’d be gone, and the Red Sox would be left with the glory and immortality and triumph that await the World Series champion. Carpenter chased a pitch outside and missed. And that’s when the singing started. This season has been something like a dream, for a lot of reasons. I’ve written before about how, living not just in Massachusetts again but in Boston, the team felt a little closer than it had in years. Removed from the ongoing horror show of Bobby Valentine and free of the cursed sell-out “streak,” the Red Sox felt like the team I grew up with. They’d play hard, they’d be respectable and they probably wouldn’t be the best, but that’s okay. And it was fun. I went to games early in April and took advantage of buy one, get one free hot dogs and brought friends up to the standing room sections of right field — and then things got weird. And instead of a way to pass the time, baseball became one of the places I escaped to. A lot of people felt the same way. I channeled a lot of it into David Ortiz, that pillar of strength whose own 17-year career has been a testament to resolve. Released at 26 by the Minnesota Twins, picked up off the scrap heap, transformed into a hero, into a goat, into a hero and finally into one of the greater World Series hitters the game has ever seen. His march during the season back to 30 home runs was a fun side story along with every other amazing turn of events that took place this season — Uehara’s ascendance to the closer’s role, Jon Lester’s revitalization on the mound and the team’s run to first place among them. Watching Ortiz lumber up to the plate, stop, spit on his hands and settle into the box is another comforting sight and a reminder of normalcy. How bad could things really be if David Ortiz is still hitting fourth for the Red Sox? But his performance in the playoffs was another beast entirely. It was a stinging reminder that he’s among the greatest October performers of this generation, and if his home runs against Tampa Bay weren’t proof enough, his grand slam in Game 2 of the ALCS against Detroit was, complete with Officer Steve Horgan’s raised arms for eternity. And in the World Series, as far as St. Louis was concerned, he was unbearable. Reaching base 19 of 25 times, hitting .688 with a 1.948 OPS and driving the Cardinals insane, he cemented a playoff reputation that never should’ve been in doubt to begin with. His play lifted his career World Series average to an astounding .455, and he was rightly given the MVP trophy. This was the same guy who carried them in 2004 and again in 2007 to the ultimate goal, who salvaged his career in 2009 and who, in April, became the glorious, defiant face of a team and a city that would always go down fighting. Ortiz was one of the first out of the dugout after Ross sealed the last out in his glove, clad in an army helmet and champagne goggles. The players mobbed on the field. Ortiz picked up Uehara and carried him around the diamond. Manager John Farrell hugged everyone in sight. Smoke from fireworks clouded the park. Uehara’s third strike on Carpenter didn’t just mean that the team I happen to like more than other teams would be the best of the 30. It meant that the revitalization of that entire organization would be complete, that Ortiz had come through to deliver perhaps the most meaningful of the three World Series he’s won, and that the city that supported them would be given an excuse to cheer and shout and scream the words to a terrible Neil Diamond song en masse in a tiny Irish Pub six miles from the park. It felt like home. Just a few days after the St. Louis Cardinals had pushed them within a game of elimination, the San Francisco Giants were standing in a downpour, celebrating the final out of a 9-0 drubbing in Game 7 of the NLCS. In an October packed with improbable outcomes in both leagues, the Giants’ roaring comeback topped every storyline. Where Tim Lincecum and Madison Bumgarner failed, journeyman Ryan Vogelsong and a resurgent Barry Zito thrived. While Bustery Posey and Brandon Belt were relatively quiet, Angel Pagan and Hunter Pence paced the lineup. And in the middle of it all was Marco Scutaro, an afterthought plugged into second base at the trade deadline, batting .500 and propelling the Giants to another pennant. There was Scutaro, who had spent more than half of his Major League career working to prove that he deserved a spot in a starting lineup, holding his NLCS MVP trophy, his 14 hits tying an LCS series record. 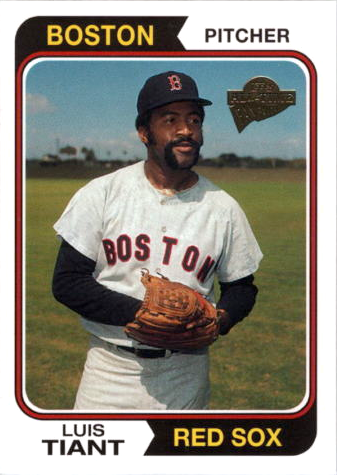 Luis Tiant long ago earnd a spot in the Baseball Hall of Fame. Ron Santo, the great Chicago Cubs third baseman of the 1960s and ‘70s, had the title of “Greatest Baseball Player Not in the Hall of Fame” removed from beside his name this week, when the Veterans Committee elected him into Cooperstown, as part of their “Golden Era” ballot. This is an event that should be celebrated. Santo, long a great ambassador of the game, was one of the best players to man third base, an under-represented position in the Hall. He was the heart of the Cubs for more than a decade, hit with power, played with grace and performed at a high level while keeping his diabetes in check in an era that wasn’t as kind to sufferers of the disease, both in perception and treatment. Of course, this is also an event to be ridiculed. Santo was first eligible for induction in 1980, and won’t be able to enjoy his induction in person — he died last year. It’s late for most folks who work a normal shift. It’s especially late for someone like me, who typically gets up around 6:15 a.m. every morning before walking downtown to work. And typically, I would be in bed by now.